UpThemes WordPress Themes Review - Are They Good, Bad? UpThemes is a relatively new company that seems to be showing a lot of promise. Since they are still newcomers to the scene of premium WordPress theme subscription services they may not currently represent the best value, but that value may well increase with time. They’ve got a lot going for them right now including their own WordPress framework which provides higher-quality options for themes. 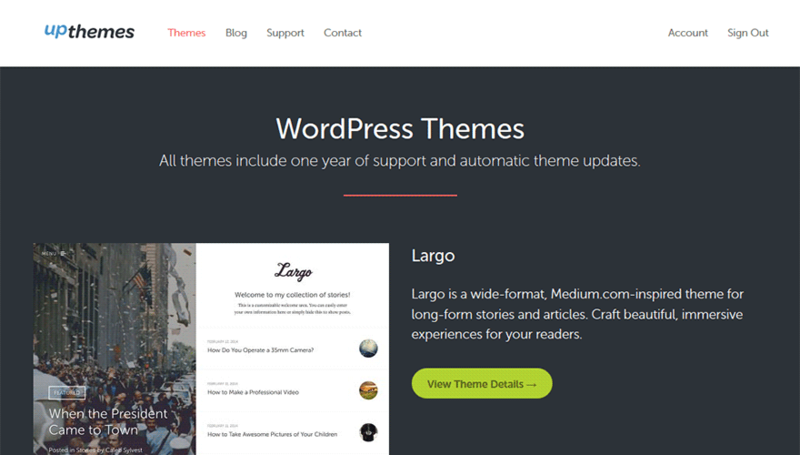 UpThemes has their own WordPress framework used for their themes that provides better image and SEO management, font control, and ability to change color schemes on most themes. The have a higher cost-per-theme average due to being a new company. UpThemes was founded in 2010 and is based in the US. The company has a PR of 6 and receives a lot of traffic, second only to NattyWP out of all the premium WordPress theme subscription services we looked at. Their popularity is growing and will probably continue to do so if they continue to deliver a great product. Three tiers of pricing are listed on the website, which is a little confusing until you figure out that Standard and Developer are single-theme purchases. Aside from offering you lifetime forum access and framework support, they only provide you with a limited value. The Developer Theme Club Membership is the package of real interest for most developers. For $99.00 a year, you can access all of the company’s themes and use the support forum during active membership. You receive UpThemes Framework Support, PSD files, and Typecase Pro. Your license allows you to use the themes on as many sites on as many domains as you choose. There are currently only 18 themes, but this is because this is a relatively new company and they haven’t had a chance to add much to their selection yet. The themes are not all that well organized or labeled, either-some of them have obvious applications for eCommerce or business, but others you may need to think about to figure out their intended use. The themes themselves are of a very high quality however and are simple, elegant, and impactful. The UpThemes Framework is an excellent tool for modifying your themes. You’re able to manage logos and background images easily and you have great control over SEO elements like titles and keywords. You can switch the color schemes, set import and export options, and edit fonts and text styles. It’s also an open-source application which means that efforts are made to improve it continuously and you can set it up quickly. The typography manager in particular grants you a great deal of power and flexibility over your fonts, which is very important for any WordPress site. While there are customer support options like a support forum and an email/ticketing system, there seems to be a lack of documentation on site. This may be because you need to register as a member to receive access to it, but we don’t see any indication it actually exists. The lack of documentation and tutorials is problematic and lowers our overall rating of what is otherwise a very promising company. This is something that needs work.